This is a year of many “firsts” for our family. My grandma (mom’s mom) passed away in April of this year. This has meant that we had our first Mother’s Day, Father’s Day and now comes the holiday season. This is going to be an adjustment for all of us. Our family tradition has always been that we go to grandma and grandpa’s Christmas morning. We eat lunch, open gifts and hang out and watch football and/or good ol Christmas movies that play over and over on TV. It is all about family time. Over the last few years Grandma couldn’t handle making the big meal for all of us so we divided things up and made the meal. She hated that she got worn out when making the meal but we made sure that the meal still went on. We also have the tradition of going to the movies on Christmas night. One memory I have was going to see “Titanic” on Christmas of 1997 and we didn’t get there early enough. We ended up in the front row for a 3.5 hour movie…ouch! When I think back I wished I would have kept a log of the movies I/we saw to be able to go back and reminisce. We were very close. Our birthdays are a week apart also. I am told that I remind people of my grandma. I am happy to have character traits of my grandma. She was feisty when she needed to be and I’m guilty of the same. My grandma and I were true kindred spirits. I spent a lot of time at my grandparents house when I was younger. As a child I would spend my sick days in bed with grandma up until I could stay home by myself. I would give anything to spent another sick day in bed with my grandma. As an adult I spent many a late nights watching TV and just shooting the breeze with grandma. My husband also loved spending those late nights with her where they would talk sports, politics, TV and much more. There were many times I went to bed and they were still at it. She was a great woman. It is hard speaking of her in the past tense, she is a great woman. 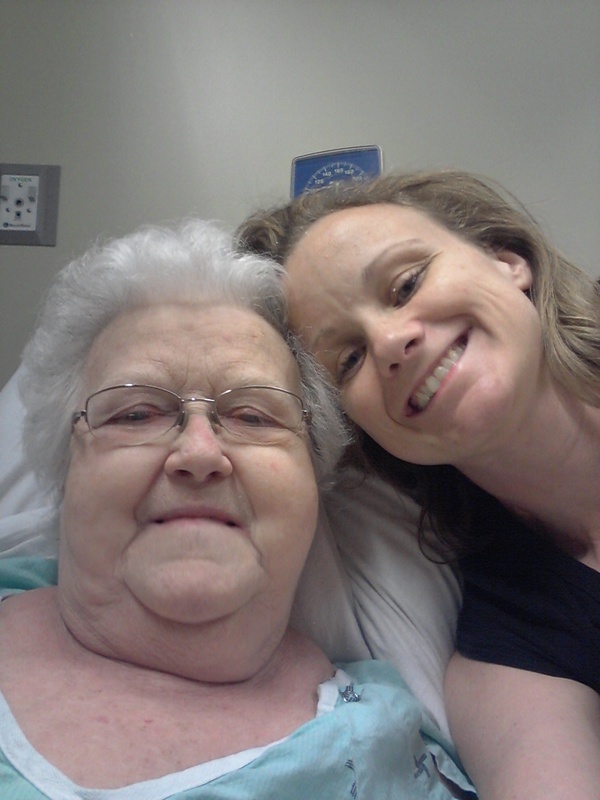 I went to see my grandma in the hospital on Sunday April 14th before I went into the hospital the next day. The picture I have added is from the 14th, 1 week before she passed away. She told me she looked horrible in the picture and to delete it, well good try grandma. I miss her every day. I know it is the cycle of life but that doesn’t make it any easier to be without the ones we love. I could keep going on and on about this great woman with many memories but I’ll end it here. Your Grandma is a very special lady!!!!! Yes she is and I miss her so much everyday!